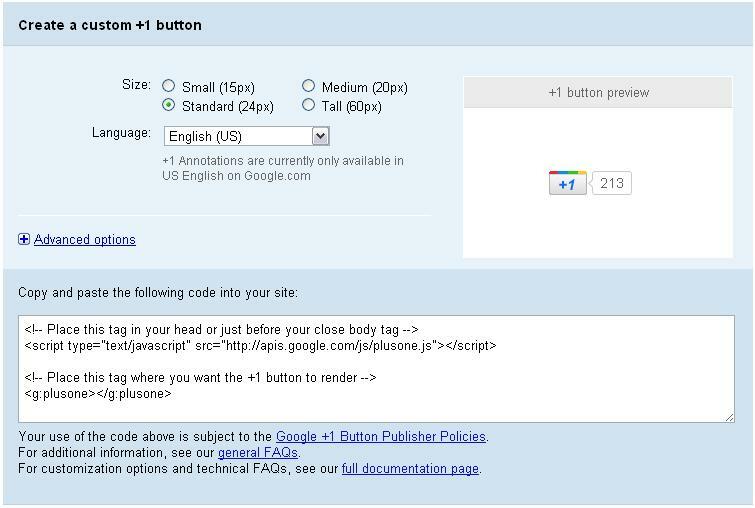 Google has launched a new feature for search results called the +1 Button. It works like a recommendation button where you can click +1 on a particular website or webpage to help others know that it’s been recommended. If you’ve used sites like Digg.com, you know how this process works. Basically, after you’ve read some content on a website and decided you liked it, you click the +1 Button and it helps other web users by ranking your site/content like a score card. In turn, websites and web pages with higher “votes” can potentially gain higher rankings on Google search results pages (SERPs). From there, I clicked on the link that took me to the code page where I had a choice of 4 different sizes for the icon as well as some other advanced settings. I didn’t spend too much time on this page as I wanted to get the button on my site ASAP! I simply chose the standard size and left everything else the same. Find the area you want the button to show up. On my site, I placed it right before the content starts so it’s at the beginning of every post. 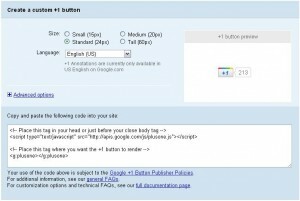 Now that you have all the code in place, go to one of your blog posts and verify that it’s showing up. Well as with any traffic-related feature on your site, all that you really can do now is wait. If the users want to vote up your content, they now have the option to do so within Google directly. If you find that you’re not getting a lot of response from this feature, try moving the button around your site to see where it works best. The purpose of this feature is to help web users find valuable content as ranked by other web users that have already seen what you have to offer. This helps Google in their never-ending quest to filter out junk sites and sites with little to no content while pushing more valuable sites up to the top of the SERPs. Let’s just hope that this feature doesn’t get abused like so many other Google features have been in the past!